As you may know, I love solitaire engagement rings for their simplicity, beauty, and timelessness. We recently added aquamarine engagement rings to our website, including a stunning array of aquamarine solitaire engagement rings. A solitaire ring features only one stone by definition. 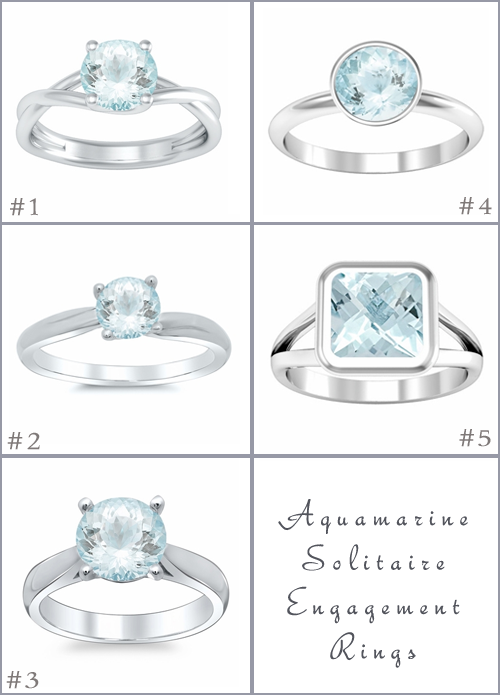 We choose only AAA quality aquamarine gemstones for each of these rings. To learn more about a specific product shown below, you may click on the link or on the photograph of the ring to be taken to the product page. The entwined band on this engagement ring adds a unique touch to an otherwise classic engagement ring setting. This engagement ring has a twisted band, which is a contemporary design that complements the round brilliant cut center stone. This engagement ring is set with a 8mm (approximately 2 carat) genuine aquamarine gemstone. It is held into place by a classic four prong setting. A bezel setting is modern, but completely timeless. I love the clean look of a bezel set engagement ring as well as the security that it offers the center stone. For the woman that craves a little extra finger coverage, a split shank engagement ring is a lovely option. This ring features a bezel set cushion cut aquamarine that measures 7 by 7mm. deBebians specializes in all types of fine jewelry, including every style of engagement ring imaginable. If you or someone that you love is interested in an aquamarine engagement ring design that deBebians currently does not carry, please contact one of our jewelry experts at your convenience. We are experts in jewelry design and would love to collaborate with you to create a custom engagement ring. Learn more about our custom jewelry design process or give us a call at your convenience.